1 of 3 Heat oil in a large nonstick skillet over medium-high heat. Season chops with salt and pepper; saute 3 minutes per side. Remove to a plate. 2 of 3 Stir cornstarch into the broth; add to skillet and simmer 1 minute until thickened. Add in capers, lemon juice and pork chops. Cover and simmer 3 minutes or until internal temperature registers 145 degrees F. Stir in parsley. 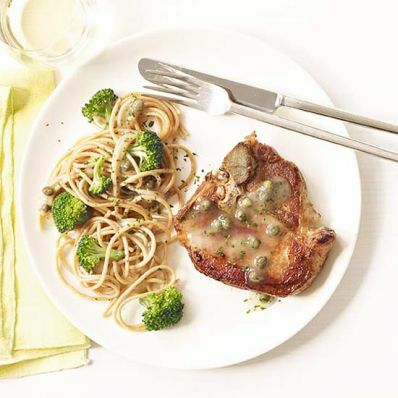 3 of 3 Serve chops with cooked spaghetti and steamed broccoli. Spoon sauce over spaghetti. Per Serving: 4 g sat. fat, 7 g fiber, 499 mg sodium, 474 kcal cal., 36 g pro., 50 g carb., 14 g Fat, total, 73 mg chol.